This was a new recipe for me, but I will definitely be making it many more times. These were some of the best enchiladas that I’ve ever had. Oh my goodness. We’ve never been happier to eat leftovers. Preheat oven to 350 degrees. In a medium bowl, combine honey, lime juice, chili powder and garlic; toss with shredded chicken and marinate for at least 30 minutes. In another medium sized bowl, combine the enchilada sauce and cream. Pour 1/2 cup of the sauce mixture into the bottom of a 9×13 baking dish. 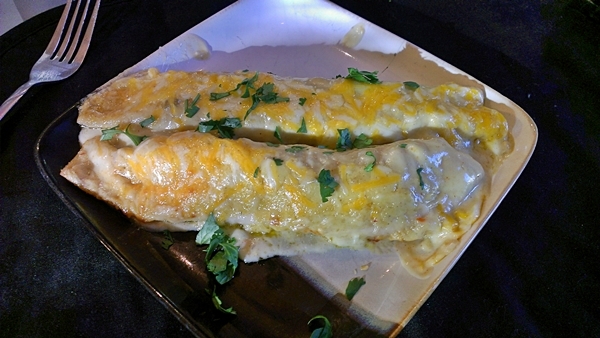 Fill the tortillas with chicken and cheese and roll, reserving 1 cup of cheese for topping. Place enchiladas seam side down into prepared pan. Pour remaining sauce over the top and sprinkle with remaining cheese. Bake about 30 minutes or until cheese is bubble and golden brown. Sprinkle with chopped cilantro just before serving.